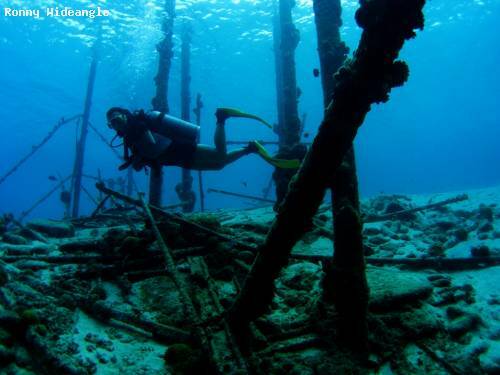 Snorkel to the old frame of shark nets, just below the surface your dive in Director's Bay starts along the steep wall. Similar dive sites, sometimes mistakenly named as the same, are named Kabaye and Small Wall. Like most dives in the Underwater Park, the wall is covered with soft coral. When you are on your way back, visit the old frames, which are down there. Here is your chance to finally see the seahorses you been looking for. Right under the boat you can find long snout seahorses and even frogfish can be found here. Take it slow, or else you'll swim by nature's beauty without even notice it. Directors Bay is a beautiful spot with lots of variety, depending if you go left or right. Be careful if you go right towards Tugboat, there's a current in that direction, so make sure you take note and turn back early.Also, cars are very often broken into here. If possible leave no valuables in the car and leave it unlocked. Best to go with one of the many dive schools like Curious2Dive or the Divebus which visit this spot regularly. Director's Bay offers two beautiful dives. It is a very good divesite for lessons also since the first few meters are only white sand. About 10 meters from the beach the drop off begins. If you make the dive to the left side of Director's Bay you will find a beautiful wall, overgrown with corals and sponges in a wide variety of colors. When you make the dive to the right side of Director's Bay you will see lots of soft corals. Often we spot fishes here that are seldom seen at other dive sites, like the hogfish. The turning point at this route is the little tugboat, where lots of fish live in and around. The boat itself is beautifully encrusted in corals.